Anybody could be Spider-Man. Maybe Phil Lord’s screenplay overplays the line, but Spider-Man: Into the Spider-Verse proves the point — joyfully. In the process, Sony Pictures proves that there is life in a Spider-Verse that can weave in and out of the Marvel Cinematic Universe. 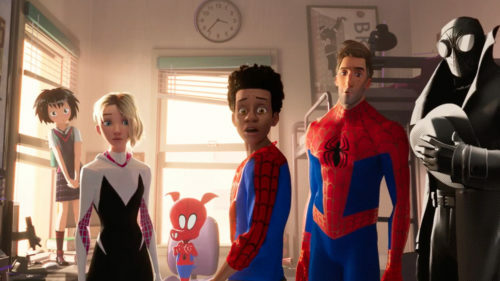 By all means, keep Tom Holland crossing over with the Avengers for years to come, just as long as we can continue with Miles Morales (Shameik Moore) crossing over with every other Spider-person at the same time. Clearly set in a different reality than the MCU, Into the Spider-Verse also has no shame in its comic book origins. Each Spider-person’s origin gets told within the pages of a comic book — a nice way to nod to some of the influential creators that have worked on the characters over the years. We may be introduced to a Spider-Man that looks familiar, but his life is cut short — tragically and heroically. Luckily for the people of that Earth’s Manhattan, Peter Parker’s death has been witnessed by Miles Morales, himself having just been bitten by a radioactive spider. As a call to adventure — and a subversion of the origin everybody thinks they know — it could have been enough. Like we’ve heard before, Miles has to learn that with great power comes great responsibility, but it’s more than that. He thinks the shoes he has to fill are Peter’s, but really, he has to find his own. 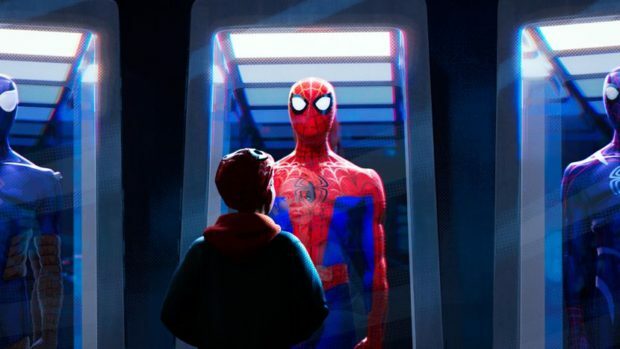 Into the Spider-Verse stays focused, even if its imagery doesn’t always. Some frames get blurred, in an attempt to imitate the experience of picking up a comic from the 60s, or with the occasional printing mistakes of a too glossy 90s comic. The filmmakers aren’t just trying to push the boundaries of what you can do with a Spider-Man movie; they’re pushing at the edges of animation, too. They’re… making art. And they’ve included a cartoon pig to boot. That’s the beautiful thing about this movie, creating an environment where disparate art styles can co-exist, and for the first time, comics can really be brought to life on the big screen. The Kingpin’s design is exaggerated and out of whack with most of the other characters, but this Wilson Fisk could have stepped right out of Bill Sienkiewicz’s pages from Frank Miller’s Elektra: Assassin. Spider-Man Noir (Nicolas Cage) doesn’t just see things in black and white; he is black and white, but he can co-exist alongside the the brightly colored Peni Parker (Kimiko Glenn) and her Spider-Mech from a far future anime world. Then there’s Peter Porker (John Mulaney), used judiciously but deliciously. Occasionally the plot does bog down as Miles struggles with the responsibility we know he’ll take, but it’s not for very long. It also serves to remind kids — and this is a family film, and a Christmas film as well — that it isn’t just about action. There are values, morality, and thought that go into being Spider-Man. Action is the reward. Prepare yourself, though. Spider-Man: Into the Spider-verse also contains the first posthumous Stan Lee cameo. It’s utterly perfect, but utterly heartbreaking. Whether intended to be or not, this movie serves as a love letter to the man and his work with Steve Ditko, but also to John Romita, to Brian Michael Bendis and Sarah Pichelli who created Miles Morales, and more — it’s a love letter to every kid who wanted to be Spider-Man. And who didn’t?